What articles on cheap travel places, budget travel tips, and living abroad were you checking out the past 12 months? On the sidebar of this Cheapest Destinations Blog (at the bottom on mobile), you can always see the most popular posts of the last three months. They don’t change that much and are often evergreen posts that have been up for years. It’s always fun to pull up the stats at the end of the year to see which new posts generated the most interest. Which articles answered some burning questions or helped people how to figure out how to save money in their travels? Which destinations are on the rise in terms of reader interest? All of the following stories published over the past 12 months got at least 2,000 page views and the top ones received 10 times that many. In most any large country, there’s a big cost disparity between the biggest, most popular cities and the smaller, less popular ones. Since the majority of hotels in the USA are a part of some big chain conglomerate, Trivago is able to track average costs across all bookings and gets millions of data points. This post runs down the best bargains in North America. I wrote about cheap travel prices in Montenegro, Kyrgyzstan, and others this past year, but the bargains in Bosnia got a lot of attention. Most tourists in this emerging Balkans destination are unfortunately just on a day trip to Mostar from a cruise ship docked in Dubrovnik. Stay a while and find one of the best travel values in Europe. It’s hard for many North Americans to believe, but it can be substantially cheaper to fly to Europe for a ski vacation than to fly to Colorado or Wyoming. Lodging, lift tickets, rentals, and meals are all less at these resorts off the trendy circuit. 9) Why Didn’t Anyone Tell Me That? Most of my books are major projects that distill lots of wisdom from myself and others into something 200+ pages. 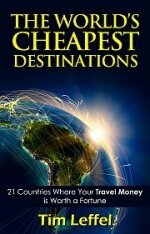 For this e-book I took the best posts from this blog that will prepare someone for long-term travel abroad. The 2017 run-down on the cheapest places to live was the top post of the year overall as the reasons to escape kept piling up. A 2018 update released near the end of the year only took a week to become one of the most popular posts of the year. This and the fact that my cheap living abroad book has sold so well tells me there’s going to be a big exodus in the coming year. I visited Albania for the first time this past summer and my main regret was that the trip was too short. I think I will return to this bargain destination for a few months next time. After all, Americans can stay for an entire year on a tourist visa! The budget airline business model is designed to pull you in with low headline fares and then charge you at least that much in fees. The far is the bait, the fees are the executives’ meals. It’s not easy to gain this system, but here’s how I do it regularly for a short weekend trip on Allegiant Air. I’ll probably do an update on this next year as new survey data comes out, but the hotel chains that rank the highest are often near the top consistently. A Hilton or Marriott is predictably decent, but that may not be true a few levels down. When you’re paying a low rate, you can often end up with some nasty surprises. In a world where there are now 70+ international hotel brands, it’s good to know which ones deliver and which are more likely to disappoint. My friends and relatives ask me for travel advice a lot. Plus I like to ask questions of vacations to figure out what makes them choose where to go and where to stay. The answers often tell me that people are paying a lot more than they need to pay when traveling. Here are the major mistakes to avoid. One of the main fears people have about moving abroad is they won’t be able to “get a job” where they’re going. For most skilled people, that’s the wrong way to think about your options. 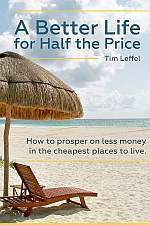 You don’t need to earn as much in cheap destinations, so it’s better to think about how to create your own portable way to generate an income. One of the cheapest countries in the world, Nepal is still a screaming bargain. I got to return to the country this year and was amazed again at what a terrific value you find in the country with the world’s tallest mountains. Click on the title to see the details. The year of 2017 gave us Americans plenty to be depressed about, but the value of the U.S. dollar wasn’t one of them. We lost a little ground in the E.U., but overall this was a banner year for traveling abroad with money earned in the USA. It was a long list. Lots of useful advice among those. Love the one on gaming Allegiant Air’s fees! Last time I opted to take whatever seat I got and ended up with an aisle and nobody beside me. Sounds nice post, I have been reading many books all over the year and they are just on traveling. I am just over growing a new passion for me that is reading about the things which are really a gem on this earth. Thanks for sharing this post.